Recent events have reminded me that being a peacemaker involves more than just being “the quiet in the land.” It also involves speaking up. (1) Conservative Reformed Christians in American are currently having a debate about Christians and the use of deadly force. Some of us Anabaptists spoke up and got a bit of public notice, and now I am praying that this will help more of our Reformed brothers and sisters embrace the way of suffering love more fully. (2) What is the proper way for “the quiet in the land” to speak up? (3) How can we do a better job of maintaining our nonresistant heritage right in our own Anabaptist churches? It just boggles my mind that anybody would be against what Jesus told His disciples in Luke 22:36: He told them if they had to sell their coat to buy a sword to do it because He knew danger was coming, and He wanted them to defend themselves. This article is about the people whom the Bible calls “refugees and exiles” on earth; namely, Christians. It’s about the fact that our weapons are not material, but spiritual (2 Corinthians 10:4). It is an argument that the overwhelming focus and thrust of the New Testament is that Christians are sent into the world — religious and non-religious — “as lambs in the midst of wolves” (Luke 10:3). And that exhorting the lambs to carry concealed weapons with which to shoot the wolves does not advance the counter-cultural, self-sacrificing, soul-saving cause of Christ. To be clear, Piper was not arguing for a nonresistant or even pacifist position. He still thinks soldiers and police officers may use guns, and that Christians may serve in those positions. He just doesn’t think Christians who are private citizens should be encouraged to pack guns for self-defense, and he advocates a very different tone than what Falwell used in his initial comments. The three discussion forums contain a wild mix of perspectives and generally a lot of confusion. The one blog news post is much calmer, and it is the cause for my post here today. This post was written by the widely-followed Reformed blogger Tim Challies. I have put little thought into the ownership and use of guns and found this discussion quite helpful in forming my thoughts. To tip my cards just a little, I find myself appreciating Piper’s efforts, especially related to demeanor and heart-attitude, but leaning more toward the points made by Wedgeworth and Thune [who both presented rebuttals to Piper]. Here is one of the most influential conservative Reformed voices, I thought, and he is just now forming his understandings regarding Christians and the use of deadly force. Perhaps we can help shape his thinking? Suggestion: If you are a nonresistant Christian, please write a respectful “letter to the editor” to Tim Challies regarding his coverage of John Piper’s article about Christians and arms. This seems to be an opportune moment to invite our Reformed brothers and sisters to more fully embrace the way of suffering love. (1) A brief response to something in Challies’ post (perhaps challenging one of the rebuttals against Piper’s article) or an affirmation of something you liked in Piper’s article. (2) A suggestion that Challies read and review Preston Sprinkle’s book Fight: A Christian Case for Non-Violence. (http://amzn.to/1YN9aAP) If he receives a minor flood of letters recommending this book, perhaps we can convince him to read it. Imagine if he would actually start promoting it! Then I pasted the letter that I had just written to Challies. After reading my post, several of my friends joined me, sending their own letters. (2) Since you have expressed interest in this question of Christians and the use of force, I strongly encourage (exhort, implore, urge, beg!) 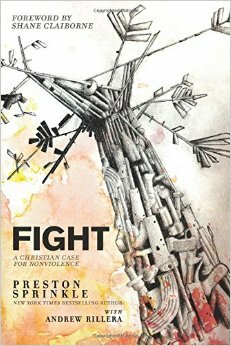 you to read and review Preston Sprinkle’s book Fight: A Christian Case for Non-Violence. A complex topic like this cannot be properly addressed in a handful of short articles. Sprinkle deals with the biblical evidence from both testaments in detail, historical evidence from the early church, and the toughest practical questions from today. He says he is from your own Christian neighborhood: “The Christian subculture in which I was raised and still worship is nondenominational conservative Reformed. I’ve been influenced over the years by John Piper, John MacArthur, R. C. Sproul, and many others who swim in that pond” (from Chapter 1). So you will identify with his way of handling Scripture. And he’s thought about this for a long time, making what he calls a “reluctant journey toward nonviolence.” Piper needs to read this book (I think he’s stranded somewhat inconsistently halfway on the journey). And I think you would find it very helpful as well. Tolle lege! I appreciate the overall respectful tone with which you responded to John Piper’s piece “Should Christians Be Encouraged to Arm Themselves”. However, I am disappointed in the narrowness of the arguments used by cited authors in support of Christians using deadly force against attackers. It seems to be basically assumed by people holding your position that the only recourse left to a man whose wife and/or family is being attacked is to stand idly and helplessly by if he does not have a gun handy. As well, the situations which are created by proponents of deadly force are extremely hypothetical and no attempt is made to sort through all the nuances of such hypothetical situations. For a very well stated stance on the non-violent position, I would strongly encourage you to read Preston Sprinkle’s book Fight: A Christian Case for Non-Violence. Mr. Sprinkle has arrived at his position “reluctantly” and as such has though through it well. Blessings. All told, three of the five letters Challies published on this topic were in support of non-violence! The narrowness of the articles I quoted was a reflection of the narrowness of the responses. I did not find any articles from people who agreed with Piper and extended his argument. I did not find any articles from people who agreed with Piper and extended his argument. Challies is a voracious reader, both of books and blogs. (He shares about eight recommended links nearly daily on his own blog.) Yet he did not find any articles from people who agreed with Piper! Where are the voices in support of Christian non-violence? To be sure, there are such voices, and they are available online. (See below.) But if Challies was not hearing voices supporting even Piper’s very incomplete embrace of non-violence, you can be sure that there are many other American Christians who have never heard a solid biblical defense of this teaching. I believe we Anabaptists, given our unique history, are specially equipped and entrusted to carry the message of Christian non-violence, of suffering love. We have a responsibility and opportunity not only to live this message (the “quiet in the land”), but also to share it with fellow Christians. It’s often difficult (perhaps especially for Anabaptists?) to get exactly the right balance of truth-telling and respectful dialog. What should we do with this heritage of silence? This is a complex question, and we are not likely to all agree on the answers. For my part, I am not sure I am ready to fully imitate Menno Simons’ aggressive approach, although I have done a few things like signing some government petitions. Nor have I felt called to participate in all modern forms of Mennonite sociopolitical activism. However, disagreements aside, I think we should be able to all affirm one form of active engagement—urging fellow Christians to follow more closely in Christ’s steps. We can’t expect unregenerate government officials to govern according to all the principles of Christ’s kingdom, but we can expect fellow believers to want to follow Christ more fully. This is why I wanted to write that letter to Challies, and why I was glad when several of my friends joined me in the effort. Please join me now in praying (silently or otherwise!) that Challies and many of his readers will read the Preston Sprinkle book that Conrad and I recommended to him. If Challies is convinced by Sprinkle’s exposition of Scripture, the ripples could impact many. Far too many of us, rather than speaking up effectively for the way of peace, are gradually drifting away from our own nonresistant heritage. One piece of evidence: I have been surprised and troubled to see how many Anabaptists (or ex-Anabaptists) post statements in support of the military come Veterans Day (or Memorial Day in Canada). In my mind, if I thank a soldier for fighting so I can enjoy a free country, then I have no business claiming conscientious objector status when the military comes looking for recruits. Genuine Christians come to a range of conclusions on this subject. And I have some questions I’m still wrestling with, such as this: If I believe it is wrong for me to use deadly force, is it ever right for me to call 911 when I or my loved ones are threatened, thus inviting another to do the deed that I cannot do for myself? But, even while acknowledging some ambiguity regarding specific life situations or specific Bible texts, it is certainly possible to come to a coherent, convincing biblical understanding of Christian non-violence. The days are past (if they were ever here) when we Anabaptists can take a casual approach to passing our nonresistant heritage on to our children. Many of our youth are now listening to a wide range of non-Anabaptist voices. Much good is coming from that; I would be very unhappy if we restricted our input to only Anabaptist sources. However, when rigorous non-Anabaptist teaching is paired with rather casual Anabaptist teaching in the home church, then doctrines such as nonresistance are likely to erode. This is especially true when so many of us are listening to the very same Reformed voices that Challies hears and promotes—the ones who have offered so little in support of Piper’s rebuttal to Falwell. I believe most of us grow up assuming rather unquestioningly that nonresistance is right; I know I did. I also heard some good teaching to support it. However, some of our teaching is not as rigorous as I think it needs to be. One example: A while back (within the past 3-4 years, as I recall) the Christian Light Publications Sunday School curriculum included a series of lessons on nonresistance. This series helpfully covered a range of texts that support nonresistance, but no biblical texts used to challenge nonresistance were included in any lesson text. I wish the series had included one or two lessons wrestling directly with these “problem texts”—texts such as Romans 13:1-5, Acts 10 (Cornelius the centurion), or Luke 3:14 (John the Baptist failing to call soldiers to lay down their arms). If this is our usual approach to teaching nonresistance, then we will lose it as soon as we hear more convincing teaching from other sources. So where do we look for solid teaching on Christian non-violence? I will end this post by again affirming the work of a Reformed author who wrestles with this subject better than anyone else I have read in my admittedly limited reading. If you want a book that wrestles meaningfully with essentially all the relevant biblical data, both pro and con, then read Preston Sprinkle’s book Fight: A Christian Case for Non-Violence. The best thing about this book is its engagement with Scripture. But it is also helpful in at least two other ways: for its survey of what the early church believed about Christians and violence, and for its honest engagement with the most difficult practical scenarios you might face in real life. This book would work well for small group discussion. Why not read it together with a Sunday School class, or with a mid-week Bible study group? If you want to build conviction for nonresistance in your church, I can’t think of a better resource. If you want more book suggestions on this topic, let me know. I have more good ones in mind. “A Case for Christocentric Nonviolence” — A paper Sprinkle presented at the Evangelical Theological Society’s annual meeting in November. “Romans 13 Doesn’t Tell Christians to Kill Their Enemy” — A blog post where Sprinkle expands his interpretation of this one text. What are your thoughts? How well are conservative Anabaptists doing at passing on our heritage of non-violence and suffering love to the next generation? How can we best share this heritage with Christians beyond our Anabaptist world? Share your insights in the comments below. PS: In an ironic turn of events, my writing of this post was temporarily interrupted when I finally gave in to my daughter’s demands that I teach her how to play Risk. I don’t know if you approve of that or not, but I did somehow manage to retain my nonresistant convictions despite many hours playing Risk as a youth.